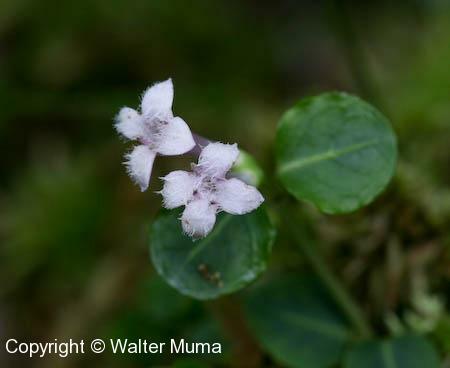 Distinctive features: Sub-Shrub; A low trailing sub-shrub with fuzzy white flowers in pairs that form into one red berry per pair. Fruit/Seeds: Red berry forms from the pair of flowers. 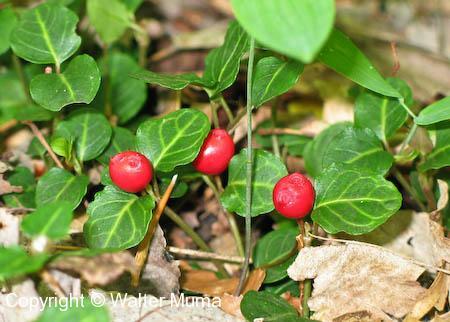 Edible: The berries are edible, but not very flavourful. Photographs: 92 photographs available, of which 6 are featured on this page. SCROLL DOWN FOR PHOTOGRAPHS. 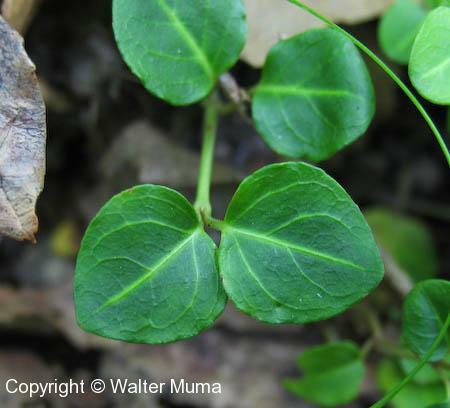 Typical Partridgeberry plants and leaves. The leaves bear distinctive center stripes. A closer view of one flower in early July. Note how fuzzy it is inside! Some ripe berries, and leaves. The fruits remain on the plant over winter. The ones shown here were photographed at the end of May. A ripe fruit showing that it has formed from the pair of flowers. This is unique and distinctive.